Today, My blog hits 100,000+ hits. HURRAY ! Thanks to each and every visitor here. 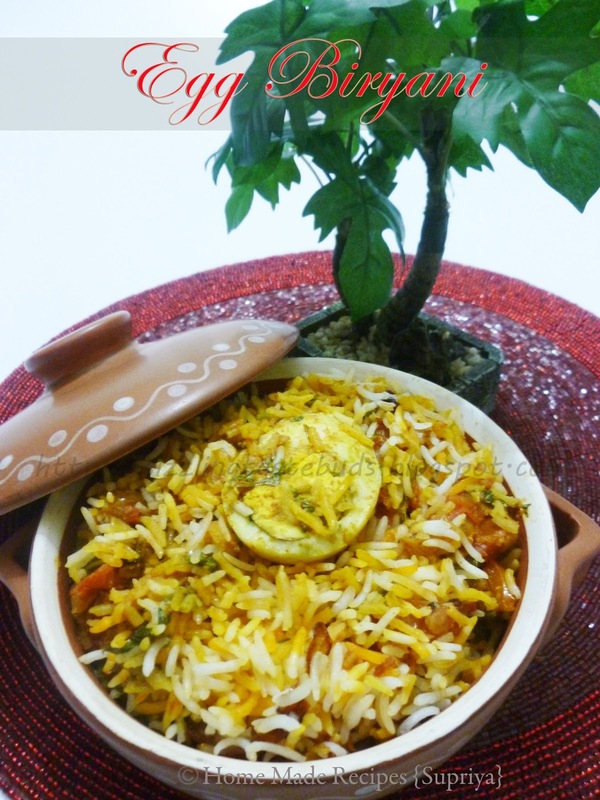 Today's special recipe is our favorite rice dish ---EGG BIRYANI. 1. Cook rice with almost 5 cups of water with little salt and 2 tsp oil. When the rice is 3/4th cooked, strain the water and spread the rice on a wide plate. Allow it to cool. 2. Heat 2 tbsp oil in a heavy bottomed vessel. Add Bay leaves, cinnamon stick, laung, Cardamom. 3. Add finely chopped onions and fry till they turn slightly brown in color. 4. Add Ginger- garlic paste and saute for a minute. 5. Add Red chilli powder, Haldi and dhania powder. Fry for a minute and then add finely chopped Tomatoes. Mix well. Cover it with a lid and cook till you notice oil separating from the masala. 7. Add egg halves and mix gently. Pour little water if you feel the masala is too dry. Cook for another minute. 8. Spread the masala evenly and spread the cooked rice on top of the egg masala to form a second layer. 9. Pour the saffron water along over the rice. Spread some fried onions, chopped coriander leaves and mint leaves. 10. Cover the vessel with an aluminuim foil and cover it with a lid. 11. Place this vessel on a tava and cook on a low-medium heat for 20- 25 mins. Hot steaming Delicious Egg Biryani is ready to be served. Note: You can substitute Tomatoes with plain curds. Don't add both. If you have more time, you can also go for wheat dough for sealing the biryani vessel instead of aluminium foil.